An award-winning USA Today columnist makes the case for how a Jesus freed from religion and politics meets the need for meaning and purpose in secular America. Tom Krattenmaker is part of a growing conversation centered at Yale University that acknowledges - and seeks to address - the abiding need for meaning and inspiration in postreligious America. What, they ask, gives a life meaning? What constitutes a life well led? 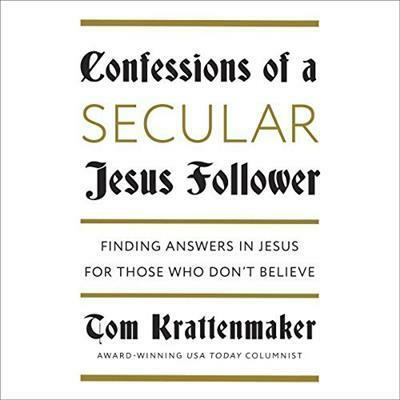 In Confessions of a Secular Jesus Follower, Krattenmaker shares his surprising conclusion about where input and inspiration might best be found: in the figure of Jesus. And Jesus not only as a good example and teacher but Jesus as the primary guide for one's life. Drawing on sociological research, personal experience, and insights from 15 years studying and writing on religion in American public life, Krattenmaker shows that in Jesus, nonreligious people like himself can find unique and compelling wisdom on how to honor the humanity in ourselves and others, how to build more peaceful lives, how generosity can help people and communities create more abundance, how to break free from self-defeating behaviors, and how to tip the scales toward justice. In a time when more people than ever are identifying as atheist or agnostic, Confessions of a Secular Jesus Follower is a groundbreaking and compelling work that rediscovers Jesus - and our own best selves - for the world of today.